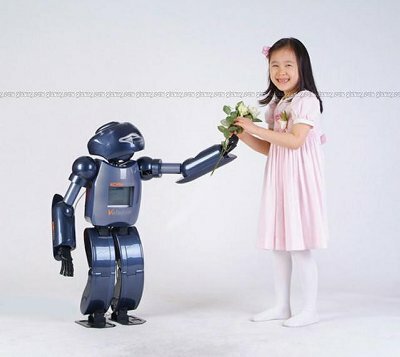 At 1-metre tall, Rogun, a robot babysitter and security guard uses two cameras for eyes for facial recognition abilities and is able to recognize “good guys vs. bad guys”. While Rogun runs around your home playing with your kids, it can broadcast video wirelessly so that you can check up on your kids throughout the day. It can also act as a videophone and wireless Internet, so when everyone is gone or asleep, and there’s a stranger lurking around in your home that Rogun doesn’t recognize, it’ll give you a call so you can sneak back into your home and beat the stranger with a wooden spoon! Rogun is the culmination of only three years’ worth of Korean bipedal robot research, and although prototypes have been very expensive to produce, KornTech expects that a mass-produced Rogun will reach a predicted price point of around US$5000. This entry was posted on Monday, June 18th, 2007 at 2:58 pm	and is filed under Misc. You can follow any responses to this entry through the RSS 2.0 feed. You can leave a response, or trackback from your own site. I think $5000 is still out of the price range of what most people would be prepared to pay, and you could get a lot of human babysitter hours for the same money with far greater capabilities. Nevertheless I think we can say that ten years from now perhaps the price and complexity of bipeds will have come down sufficiently for there to be a viable market. “Security robot” is always the application of last resort, when the manufacturer can’t think of any other uses. I think security is a poor application compared to installing multiple fixed cameras which can be remotely recorded/monitored. Even if someone does break into your home a robot is unlikely to be able to do anything about it, and if it’s an expensive device may itself become a target for theft.